On Tuesday, the Indian women's cricket team won by 8 wickets in the second ODI against New Zealand at Mount Maunganui. The victory helped the visitors take an unassailable 2-0 lead and hence seal the ODI series on New Zealand soil. 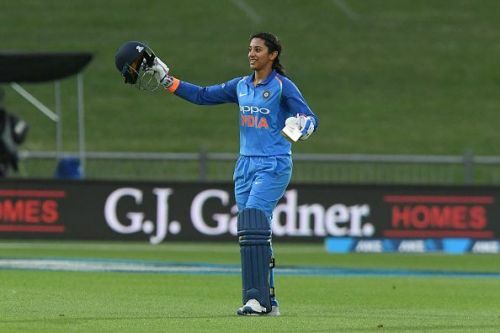 After scoring a sublime century in the opening ODI, Smriti Mandhana chipped in with an unbeaten knock of 90 runs to lead India's dominant performance against the Kiwi bowlers. Mandhana has scored 1797 runs in 46 ODIs so far. Out of those, 864 runs came during the last 12 months. She has also scored 4 centuries and 14 half-centuries in her career thus far. Mandhana debuted in the ODI against Bangladesh women in Ahmedabad on April 10, 2013. In her career, she has scored her runs at an average of 42.78 and a strike rate of 84.01. Between January 2018 and January 2019, Mandhana played 14 ODIs and amassed 864 runs at an average of 78.54 and a strike rate of 93.70. In doing so, she made around 48 percent of her career ODI runs in the last 12 months. In the history of Indian women's ODI cricket, Mandhana is already the fifth highest run-scorer. She is behind only Mithali Raj (6613 runs), Anjum Chopra (2856), Harmanpreet Kaur (2220), and Jaya Sharma (2039). Mandhana is just 267 runs behind Jaya Sharma's tally. If she continues her impressive form, she can surpass her and move to fourth spot in the next few innings. The 22-year-old Mandhana had won the ICC Women's Cricketer of the Year and ODI Player of the Year award for her remarkable form in 2018. She was also included in the ICC ODI Team of the Year as one of the two openers. The stylish left-hander is currently at number four in the ICC Woman's ODI Rankings. She is behind number one ranked Ellyse Perry by just nine rating points. If she sustains her majestic form in the upcoming matches, Mandhana can dethrone the Australian and surge to the top spot.